At this time of the year my southern Spanish vegetable garden is lush with green vegetables that in the north are considered spring vegetables. There are several varieties of lettuce and endive, Cima Di Rapa, crispy dark green chard, french beans, Mange-Toute and the sweetest baby courgettes……… So I want to feature this abundance in my meal. I dither between choosing to prepare a composed salad, or grilling some of the vegetables. In my other veg patch I find some small purple and white striped aubergines and a few asparagus spears. 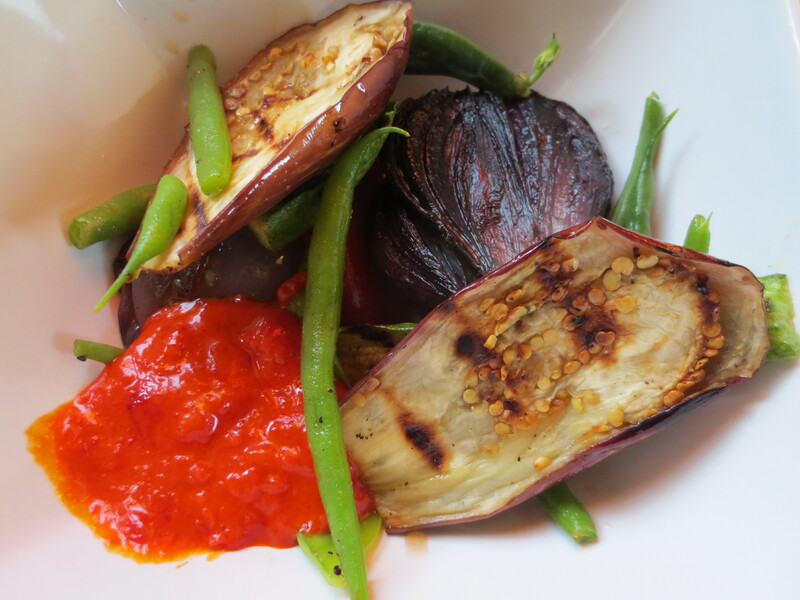 That helps me to make up my mind, grilled vegetables with a sweet and spicy pepper sauce. My regular readers will know that I preserve whatever surplus I have of garden produce as I go along, so the sauce is based on a couple of these, the recipes for which you will find on previous blogs. SWEET AND SPICY PEPPER SAUCE Half a small jar of Red Pepper Salad 2 tablespoons Chilli Jam Juice of half a lemon Simply whizz together in the food processor The main course was Orechiette Pasta with Beef and Tarragon Meatballs in Mushroom Sauce. BEEF & TARRAGON MEATBALLS WITH MUSHROOM SAUCE FOR 6 400 grams lean minced beef 2 garlic cloves – peeled 1 medium egg 25 grams dried breadcrumbs – preferably from good bread that you have dried and crumbed yourself Half a dozen sprigs of fresh tarragon Salt and freshly ground black pepper Plain flour Olive oil 100 grams fresh mushrooms, preferably ceps, but chestnut or oyster will do 20 grams dried ceps 300ml chicken stock Put the dried ceps in a small bowl and pour over enough boiling water to just cover. Leave to reconstitute. Crush the garlic cloves with a small amount of salt. Take the leaves off the tarragon stalks and chop finely. Put the minced beef in a bowl with the garlic, tarragon, breadcrumbs and egg. Mix thoroughly. Season with black pepper. Leave for about half an hour for the breadcrumbs to absorb moisture and bind the mix. Take small amounts of the minced beef mix and roll into balls and then roll in the flour. It is tedious to make the balls small, about 1.5 cm across is ideal, but they mix so much better with the pasta and are a perfect little mouthful this size that it is worth the effort. Heat some olive oil in a large frying pan and fry half the meatballs in one batch over a medium heat, turning from time to time to lightly brown them on all sides. Remove to a dish and fry the other half of the meatballs. Remove these too. 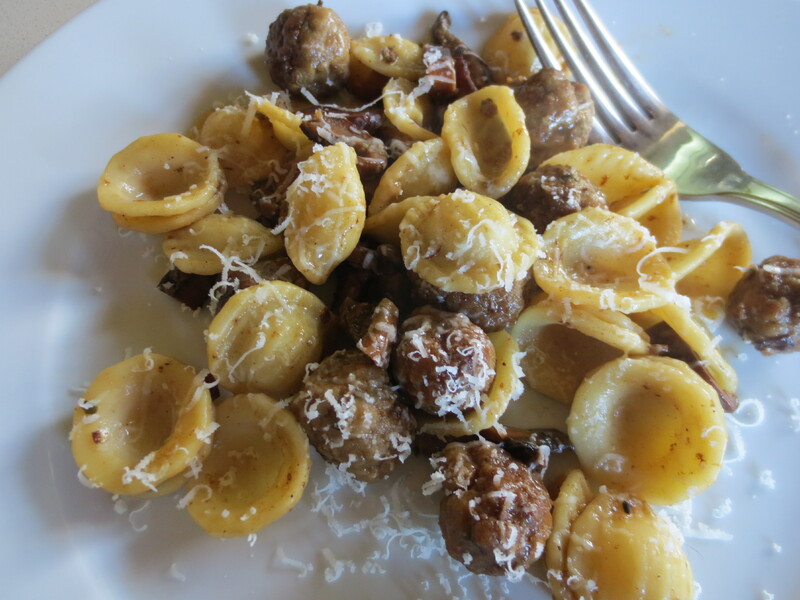 While the meatballs are browning cut up the mushrooms into quite small pieces. Once the meatballs are out of the pan, add the mushrooms to it together with a little more oil if needed and gently fry them for about five minutes. Add the stock, soaked dried mushrooms and their liquid and bring to a simmer. Simmer for five minutes then add the meatballs and any juices that have seeped out of them. Simmer for five to ten minutes. Serve with pasta and parmesan cheese. 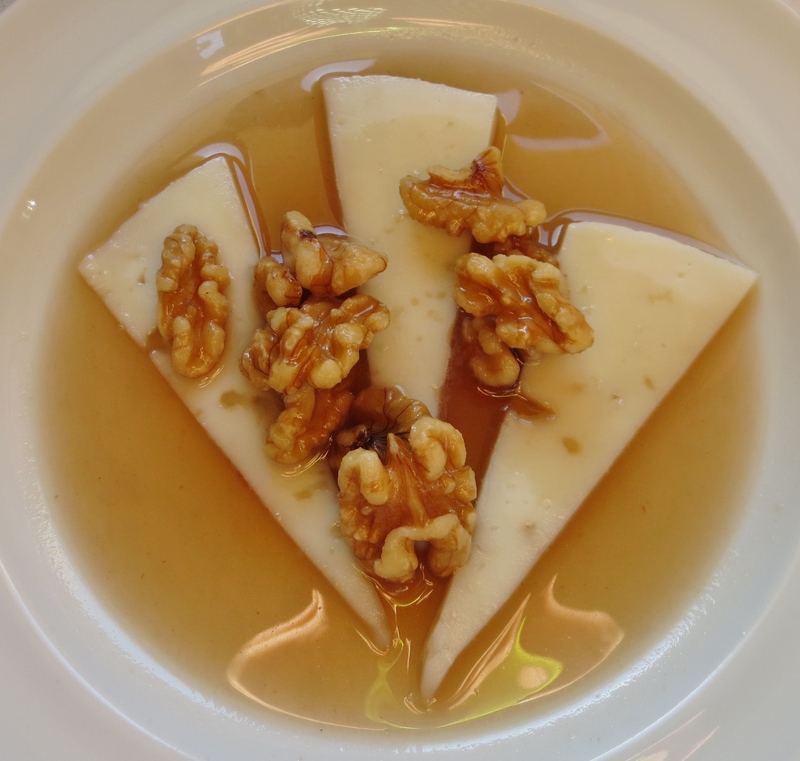 For dessert, the Spanish classic, Cheese with Honey and Walnuts, the recipe appeared in a previous post.